Jack Ikenberry has quickly made a name for himself not only at Lee-Davis but in the entire state. After already having posted an impressive 16:38, he has positioned himself to be one of the best underclassmen in Virginia. Those accolades and his amazing potential are why he was chosen to be Virginia's Hoka OneOne Future XC Star. This weekend at the MileStat.com XC Invitational pits the top two ranked teams in the state and last year's state champions in Group AA and Group AAA respectively between VA #1 Blacksburg and VA #2 Lake Braddock. Last fall, Lake Braddock was the state's best and nearly qualified for Nike Cross Nationals despite not running with their #1 at the regional qualifier meet. This fall, the Blacksburg girls appear in great position to compete for an NXN berth as they are just off the #1 ranking in the entire Southeast region and have been undefeated this season with the exception of a 1 point loss at Great American to SE #1 Assumption of Kentucky. Lake Braddock has several key members from last year's squad to challenge Blacksburg on Saturday at Pole Green Park including 3 talented individuals who have ventured under or right at 18 minutes for 5K in Hannah Christen, Katy Kunc, and Katie Roche. 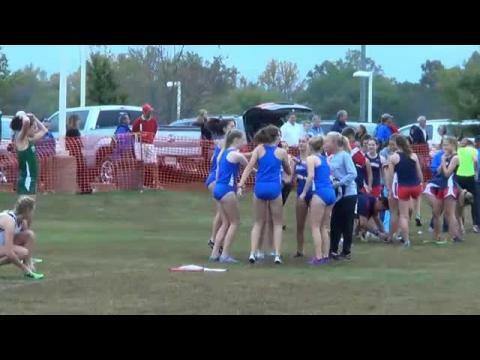 Virtual meet girls preview below, which is generated using the season best 5K times in the database of all the teams entered in this weekend's meet. After hosting the MileStat.com Cross Country Invitational for the past several years at Pocahontas State Park in Chesterfield, meet management has decided to move the event to Pole Green Park in Mechanicsville for the 2013 event on the date of Saturday, October 19th. Photos from the October 19th weekend's meets as we had 7,274 images from 4 photographers between the MileStat.com XC Invitational (Mary Ann Magnant & Scott Reid), Runnin with the Wolves Rocktoberfest (Heidi Raab), and Third Battle Invitational (Tim Dillistin). The 7th annual MileStat.com XC Invitational will be held on Saturday, October 18th for the first time ever at Pole Green Park in Mechanicsville, Virginia. Partnering with the Lee-Davis high school cross country team, coaches, and parents, MileStat.com is excited to be bringing the one of the state's best final invitational meets to one of the Richmond area's best cross country courses and showcasing it to a greater audience with a total of 78 schools and over 2,300 runners expected to be competing over a total of 10 races starting at 9:00 AM and lasting through 2 PM this weekend. 16 minutes flat or faster might be the cut-off to earn a top 25 medal in the varsity A boys elite race on Saturday at the MileStat.com Cross Country Invitational as currently 23 runners are entered with season bests under 16:00, while many others are knocking on the door of that time barrier and aiming to accomplish that feat against great competition this weekend at Pole Green Park. Thomas Edison senior Louis Colson will lead out the stacked field as the current US #24 ranked runner by MileSplit and a 5K PR of 15 minutes flat, which he could definitely threaten the course record of 15:24 by 2011 Foot Locker finalist Silas Frantz of Douglas Freeman. Virtual meet boys preview below, which is generated using the season best 5K times in the database of all the teams entered in this weekend's meet. 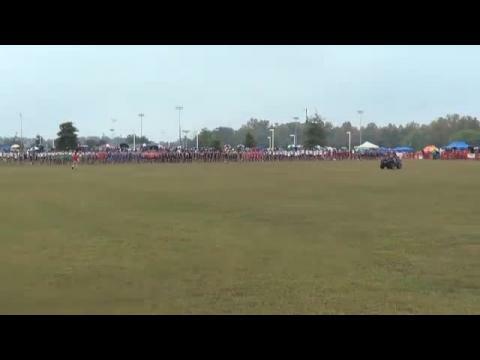 We want to thank all teams, athletes, coaches, and spectators who supported the MileStat.com XC Invitational with their attendance on Saturday at Pole Green Park in Mechanicsville. We want to also give a special thanks to Lee-Davis High School and their parents, coaches, and athletes who did a superb job as the host school for this weekend's event! Below are merged team scoring meet results from the October 19th invitationals which schools from Virginia participated in including the MileStat.com XC Invitational, Third Battle Invitational, and Runnin with the Wolves Rocktoberfest. 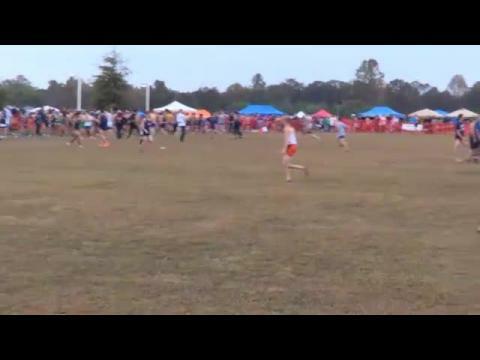 The James Robinson boys proved themselves worthy of their #1 state ranking at the MileStat.com XC Invitational with a 13 second spread for their top 5 from 16:10 to 16:23 to allow the Rams to win by 26 points. 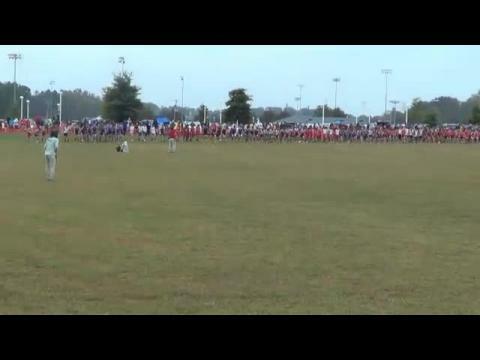 32 of the top 50 fastest girls in Virginia this fall at the 5K distance raced at the MileStat.com XC Invitational this past weekend with 15 of those runners achieving their season or personal best times on Saturday at Pole Green Park in Mechanicsville. A list of the top 50 fastest girls cross country times in Virginia over the 5K distance in meets constested so far in the 2013 season as of October 21st. Click on the next page link to go deeper beyond the top 50 on the below list. High school race assignments for teams in the varsity and JV races for Saturday's MileStat.com Cross Country Invitational at Pole Green Park in Mechanicsville, Virginia. Race videos from the 2013 MileStat.com XC Invitational held on Saturday, October 19th at Pole Green Park in Mechanicsville. Six days are left to enter your team and runners into this year's MileStat.com Cross Country Invitational, which will be held on Saturday, October 19th at a new location from prior years at Pole Green Park in Mechanicsville, Virginia. As of October 8th, a total of 66 schools and 1,586 runners are entered into the meet and we expect the total number of athlete entries to potentially go over the 3Ks when all teams have entered their meet rosters. Yet we still have room for more teams! So don't delay and register today before the Monday night (10/14) online entry deadline at midnight.